This was my second trip to Helsinki together with Mr Lifecruiser, though I have been going on those cruises for many, many times in my life. Every summer until I became 12 years old, to be exact. It’s longer time on open Sea on the cruise to Helsinki than it is to Åland, which is the second cruise destination which also is popular among Swedes. The last two cruises have been with one of their biggest cruise ship Silja Symphony, built in 1990, 203 meter long, makes 21 knots and can take 2852 passengers. On our cruise we were only about 1200 passengers, which felt rather empty actually. 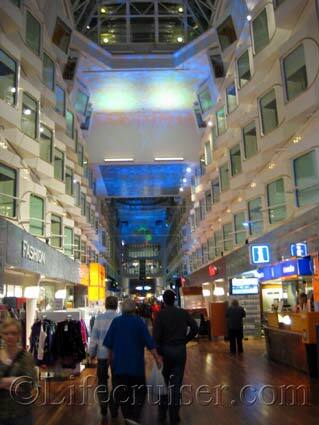 The ship has The Baltic Sea’s longest pleasure deck: 140 meter long, with some shops and several restaurants placed along it’s sides. There’s a pub in one end of it and the night club in the other end. The taxfree shop is one deck below, though for us Swedes there isn’t much difference in the prices any longer, so I wouldn’t call it taxfree shopping for us. 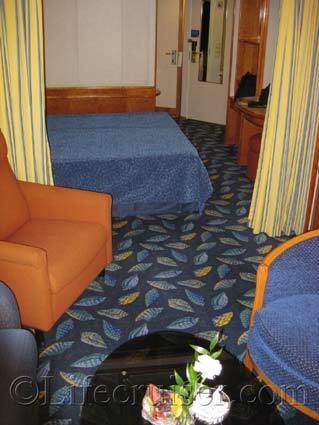 We had our luxury cabin at deck 11, a Commodore cabin in a locked area where only the passengers that had a cabin there, could enter. 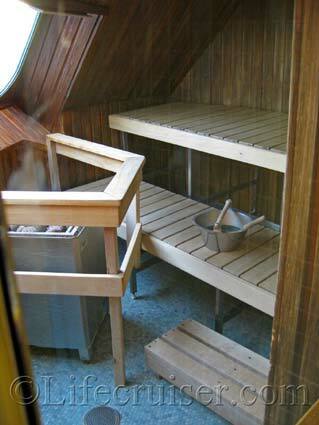 Our cabin were 25 square meters, giving us enough space with a small living room part. It was really nice and quiet with an own lounge with a hostess to help us with what ever we wanted – and a bar, even though we also had a mini bar at the cabin too, where our Champagne were waiting for us. There were also a sauna we could book and of course we did go in there – you can’t go to Finland without having been to their famous Finnish sauna! 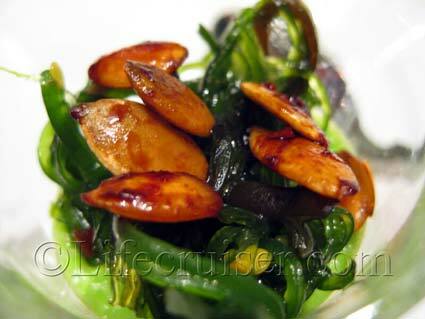 However, the best experience for us on this cruise was without doubt the gourmet restaurant Bon Vivant. It was not so much the interior of the restaurant, nothing special there, but the great service and the delicious food. Our waiter were only a trainee, but I tell you that he did an excellent job! It was the best service we have had in a long time actually. He even did go to the neighbor place to get the right Martini Dry for Mr Lifecruiser as a fore drink. Yes, I had Champagne. To go with our drinks they gave us a choice morsel with avocado and roasted seeds, which we didn’t order, but was simply delicious. Our dinner couldn’t have started better. They even have a Sommelier to help out with the wine choice (and a shop were you can buy quality wines), so our trainee got several advices for wine choices for us and even brought out them all for us to taste. That’s first class service! 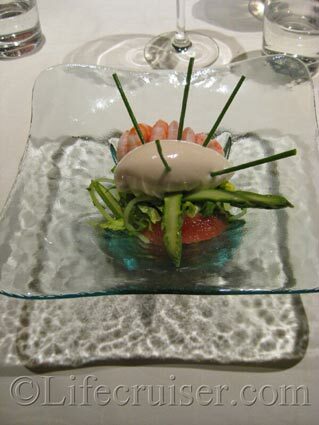 Starter: Shrimps with avocado mousse and ruby red grapefruit sorbet, which was so fresh and so well balanced. Champagne to drink, but since it were new to us I can’t remember which one it was. Main courses: Torbay sole (Rödtunga), leek and vendace roe sauce (Chablis, Premier Cru to drink). The Torbay sole were perfect. Shank of lamb, potato and lime zest (Chablis, Premier Cru to drink). 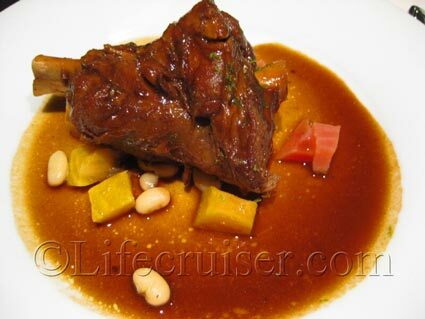 Mr Lifecruiser said that this was the best lamb he had eaten in a long time, maybe even ever! We also had breakfast included at the Bon Vivant restaurant too, even though we were a bit too late to taste everything at the gourmet buffet in the mornings – only the Champagne…. There were a short show in the evening in the Atlantis Night Club too. Young musical artists who were great, even though it were not the best show I’ve seen. There also were a band playing so people could dance. I did record some of it, but unfortunately I had succeeded to change the settings without noticing (no, I was not too drunk!) so the movie is crap. Sorry. We walked around for hours in Helsinki, exploring as much as we could and photographing. There is many old or interesting buildings in their cobbled stone streets. Perhaps the most significant of them – or at least most visible, is the beautifully white Cathedral. It’s gigantic with big, steep stairs leading up to it. My sister Susan think it’s very romantic, what do you think? So what did we think of the cruise? To be honest: no favorite of ours even though we managed to have a rather nice time anyway. There is something I can’t put my finger on that don’t appeal to us, but maybe it will to you. We found the cruise ship rather worn out, there were better shows before and even though Helsinki is lovely in the summer, it was freezing cold and windy this Thursday, not such a pleasure it could have been walking around there. Conclusion: Go there in the summertime, check up the shows on the ship before you decide which date to go and don’t pay full price for the luxury cabins until they have renovated the ship. 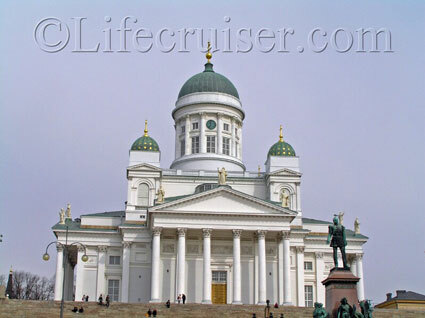 See all Lifecruiser’s photos from Silja Symphony Cruise Ship and our other photos from Helsinki City. Sounds like fun. Your food pictures are making us hungry! Thanks for the ship and weather tips. Very helpful. Are you certain drinking wasn’t involved in the video settings? I tend to agrre with you – you know we have the choices from Oslo to go to Kiel in Germany with modern luxury cruiseships, go to Copenhagen, with better accomodations and food, or go on a short 20 hours trip. I preferare a luxus lugar and godd food and a “flat Sea”. Else I prefere something more adventerous. Excellent photos from must have been delicious dinners, but I like your comments. These “tours” are for me out of date – may be it’s age, may be we have too much to compare. Then it’s much better to stay at Fårö – that’s clture and nature. Like we love to stay in our summerhome – you know. Beeing private and at the same time close to local , cultural happenings (at least during summertime) and the nature. Sounds like that dinner was the best part of the trip. It certainly looked great and having champagne is a nice addition. My favorite adult beverage. I’d say you have just done this too many times? It doesn’t hold a lot of appeal to you when it’s cold outside. You weren’t happy with the ship. Just a couple of guesses why you aren’t all that thrilled. The cathedral in Helsinki looks stunning to me. I’d love to see it – I’m always interested to see cathedrals and churches – but not by a cruise. For some reason a cruise just doesn’t appeal to me, possibly I just prefer to travel independently. That’s one cool ship you got there, captain. I could live on that ship and never want to go back home. It certainly looked cozy! Not sure that would be my top priority for a vacation, but I really enjoyed the virtual tour. enjoy the rest of your trip. am excited to read more! Oh well, at least it was a free trip so you didn’t waste your money. Still, it can be disappointing when it’s not up to par. However, the food looks and sounds delicious. That cathedral is beautiful, very Grecian looking. An interesting post for those of us who live in warmer climes. Thank you. It sounds fantastic and that dinner looks superb!! The diaporama is nice and I’ve choosen my shoes and these for Pierre! Of course Helsinki isn’t an exotic destination for you as it could be for me, more as my daughter live in Finland! i’m jealous! I would want to be there but luckely Anaïs will at home in Juny! 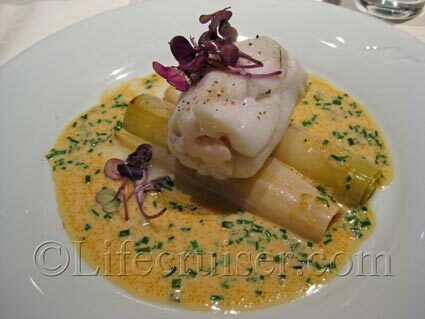 i see so nice seafood on the pictures…But I’m full with pierre’s diner! i can’t no more! I’m full! not even a glass of champagne! I think for a diet too! I would love to go on a cruise in Europe and visit the surrounding beautiful countries. It’s romantic to travel with your love. Sounds superb. Did you check out the church in the rock in Helsinki – amazingly different for a church. Me and partner are thinking of our next holiday being Helsinki-Tallinn joint visit (not a cruise, but I suppose there is such a thing as a ferry). That cruise looked fun! I hope your trip around Europe in the summer was fun! Will have to catch up with your blog some time! You will like both of them Emma, but they really are different from each other. Tallinn Old Town will remind you about Stockholm’s old Town, I’m sure!